Of the many Victorian bestsellers doomed to oblivion over the course of the twentieth century, one that little deserves its obscurity is Israel Zangwill’s 1892 Spitalfields novel Children of the Ghetto. It is a big, baggy monster of a book, brimming with vitality and jangling with questions and arguments about the destiny of Jewish immigrants in Britain. What is more, it has an acute sense of place. Zangwill’s intimacy with the institutions, streets and interiors of Jewish Spitalfields makes the novel a fascinating exploration of what this densely packed neighbourhood meant to the people who came at the turn of the twentieth century to build new lives here. 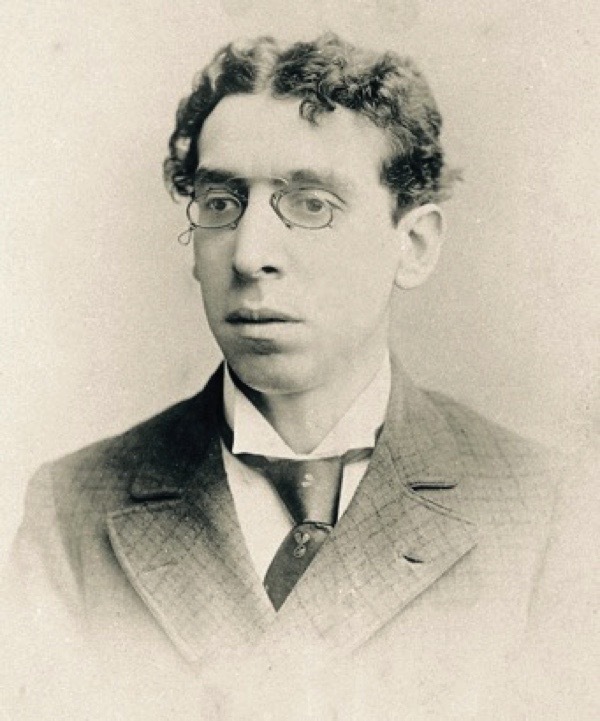 Israel Zangwill was born in 1864 in a small square near Petticoat Lane market, the son of a Russian-Jewish peddler. From these humble origins, he went on to become a star pupil at the Jews’ Free School in Bell Lane, later staying on to teach while he studied in the evenings for a degree at London University and began to publish satirical sketches. 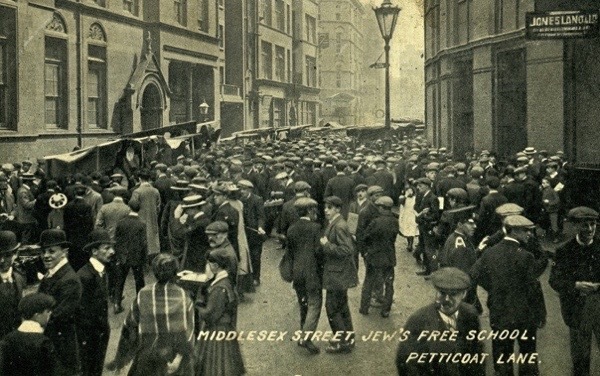 It was during his years as a schoolteacher in Spitalfields that Zangwill became witness to the dramatic changes sweeping the area during the eighteen-eighties and nineties: the huge influx of Jewish immigrants fleeing pogroms, persecution and economic hardships in the Russian empire and settling in their tens of thousands in east London. What a great subject for a young aspiring novelist! The ‘London ghetto’ was much talked about but very little understood. As a graduate with literary ambitions who had also lived and worked in Spitalfields for most of his life, Zangwill was able to write for a wide Victorian readership with unique credibility and authority. 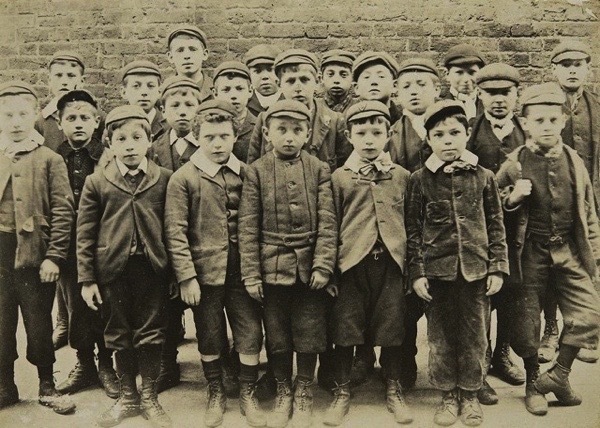 Children of the Ghetto offers a panoramic account of Jewish lives in Spitalfields. In the background, Zangwill observes the changes that were reshaping east London’s landscape: dilapidated housing being demolished as part of new urban improvement schemes and austere new blocks of model dwellings springing up. In the foreground, the author’s eye surveys tailors and teachers, sweatshop masters and trades unionists, rabbis and Yiddish actors, immigrant parents and their English-born children. He reveals a community riven with divisions, struggling over its many possible futures. Zangwill’s is an unconventional voice in Victorian literature. There is a good measure of untranslated Yiddish words in the novel, so that even if you happen to know some Yiddish you still feel as if you are eavesdropping on a subculture you will never fully grasp. And while many of his contemporaries were troubled by the noise, the mess and the muddle of the Jewish East End, Zangwill glories in it. He relishes the eclecticism of the Jewish liturgy, which he describes as ‘like an old cathedral in all styles of architecture, stored with shabby antiquities and side-shows and overgrown with moss and lichen,’ as much as the disorderly multilingual babble of the costers in Petticoat Lane. His prose has an idiosyncratic exuberance, evident here in his description of the morning rush hour outside the Jews’ Free School in Bell Lane. Here, Zangwill’s love of crazily proliferating lists produces a vivid tableau, but it is also a sharp commentary on the process of transformation that is already shaping the future of Spitalfields’ Jews. Even as he revels in the vitality of the children swarming through the alleys, Zangwill does not flinch from the humiliation and ugliness of their poverty. And that one sullen little girl squirming at the school gate hints at how Bell Lane was also in many ways a battleground. 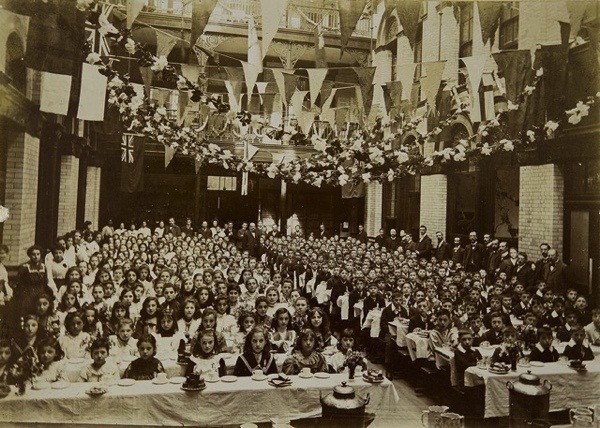 Founded as a philanthropic venture, the Jews’ Free School maintained and intensified its Anglicizing mission as the immigrant population expanded. In particular, the school dedicated itself to the eradication of Yiddish — the vernacular mix of German, Russian and Hebrew spoken by Jewish immigrants and considered an obstacle to their integration. 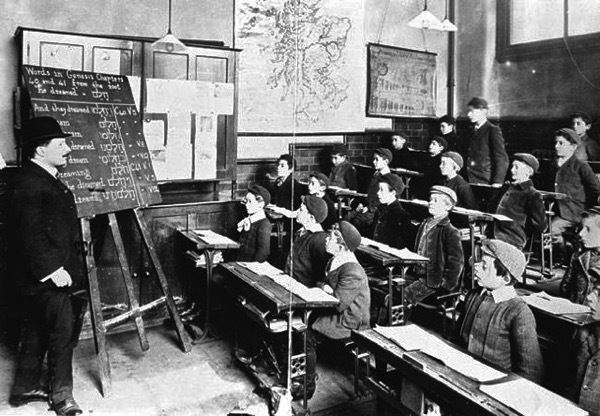 Using Yiddish got Zangwill into trouble with the school authorities when he was working as a teacher and published a small section of Children of the Ghetto, peppered with Yiddish words, as a stand-alone essay. But that attitude towards Yiddish as the language of the past was widespread. Zangwill himself probably recognized that it was alienating for his wider readership, and with each edition of Children of the Ghetto he included fewer and fewer Yiddish words. 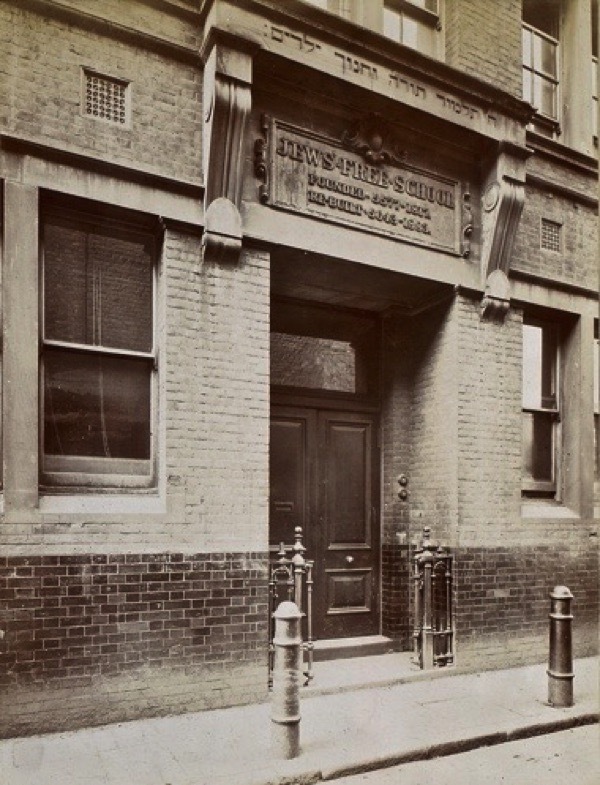 As Zangwill learned, the Jews’ Free School was a Victorian temple to aspiration through strict discipline. Unlike the cramped, dark homes that the pupils came from, its corridors were wide and open to light and air. 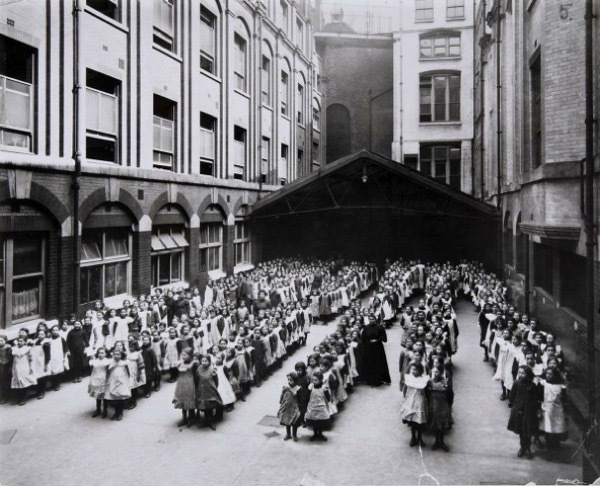 With its huge courtyard for drill and its large arched windows it looked like a giant factory for reassembling children or a warehouse for storing them. 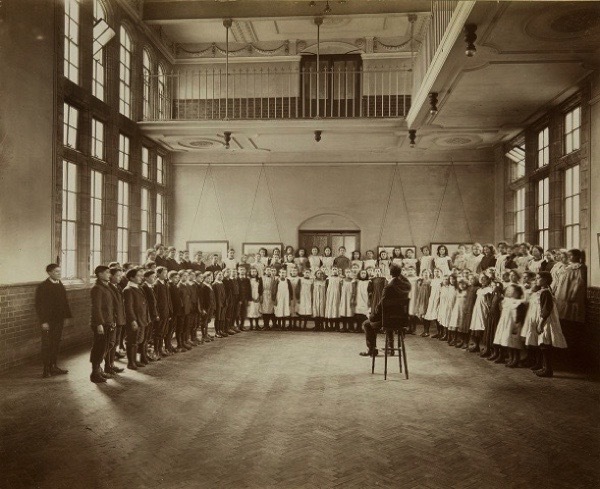 That is how the school represented its pupils, as I discovered in a series of photographs in a late-Victorian album in the archives of the Jewish Museum, London. 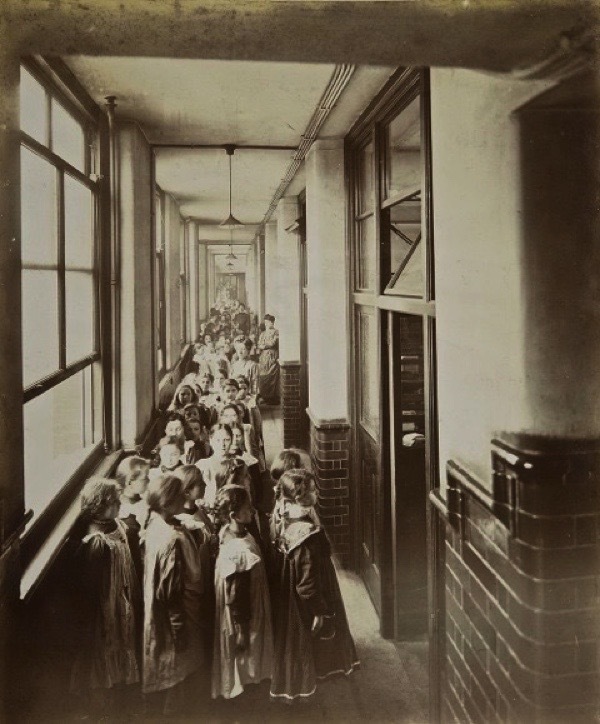 One image, of girls in the first class, is titled ‘As They Enter School’, and captioned underneath ‘Raw Material: Children arriving from Roumania, Russia, Germany etc, unable to speak English’. 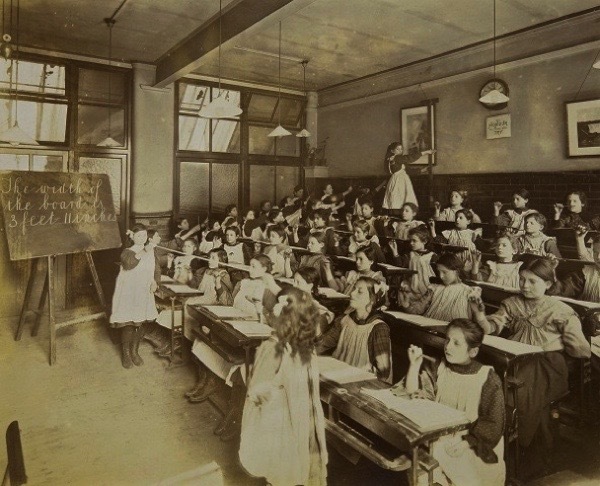 A second photograph, showing girls from the top class, is titled ‘As They Leave School’, and captioned ‘Finished Article: After several years training in Hebrew, Reading, Writing, Arithmetic, History, Geography, Literature, Science, Drill, Gymnastics, Needlework, Cookery, Laundry and Sports’. 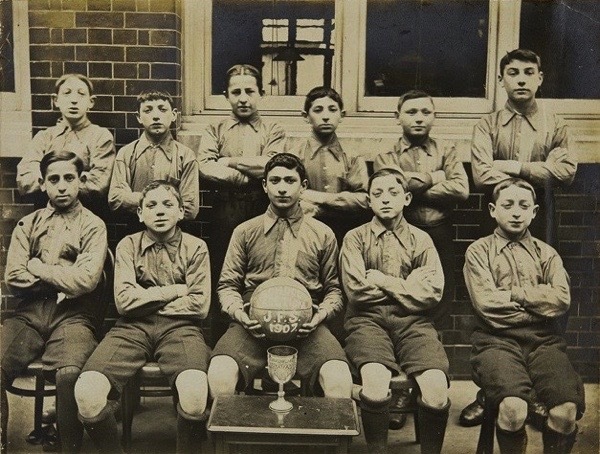 The images resemble Dr Barnardo’s ‘Before & After’ photographs of the destitute street children he rescued, and proudly present Jews’ Free School leavers, similarly, as fully trained and accomplished modern British citizens. 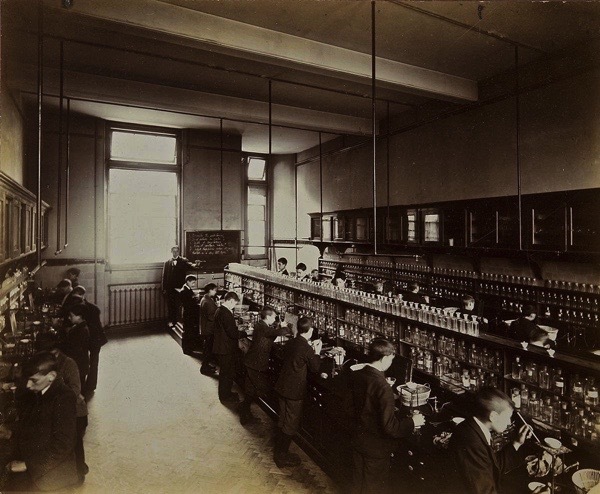 It is this production line that Zangwill writes of in his sketch of the motley mob of kids piling into school. He takes particular pleasure in the great diversity of the children, these are kids from all kinds of families, who have all kinds of destinies ahead of them. But Zangwill’s description of the chaotic variety of the ghetto school also has a particular poignancy as a reflection on the process that aims to reduce it to order and uniformity. The school bell in Bell Lane calls the children to come and be Anglicized, ‘to be,’ Zangwill says, ‘ground in the same great, blind, inexorable Governmental machine’. It summons them to their future but it also tolls for their old life. And as the novel unfolds, we see the everyday tragedies that result: parents no longer able to communicate in their mother tongue with their children and young people embarrassed by the foreignness of their elders. In Children of the Ghetto, Zangwill explored the tension between his conviction that Jewish immigrants needed to join the modern world, and his attachment to the unruly energy of their distinctive culture. It was a paradox that was to preoccupy him throughout his writing life. Just popped into my e box and after breakfast, so looking forward to reading this and exploring the photos. Thank you Gentle Author dearest of all servers, you have done it again! worth and who liked to get inside the minds of the people and see them for who they really were not just ‘the poor’ under privileged. The photographs accompanying this article are a treasure, an open window into a past world where now, we walk in their ghostly footsteps. Once more The Gentle Author has fed me my daily bread. Thank you. You never know, we may have met some of those children all grown up and aged standing at the local bustop or living next door ! I look forward to reading Zangwill and learning about this vanished life. Too bad the school building no longer exists. To their credit, it looks like the Rothchilds spared no expense to build a grand, spacious building. As in all photos of poor children taken at that time, they appear to be malnourished. Spitalfields had its counterpart in the Lower East Side of Manhattan; a place of terrible poverty for Jewish immigrants, but one that also had the promise of eventual assimilation and upward mobility, unlike Russia and Europe. Thanks for this interesting and informative blog, the photos you post make it especially interesting. Congratulations on a GREAT post! Way back in the early 1960′s (it may have been 1963/4 – the Zangwill Centenary), age 14, I won what was then the huge sum of 25 pounds in an essay competition sponsored by the Maccabeans (do they still exist?) on the subject of ‘The East End of London as portrayed in Zangwill’s Children of the Ghetto’. That was in the days before copiers etc, and I wrote it in pen and ink. I had no copy. I would LOVE to retrieve a copy – a few years ago I asked at the University of Southampton, which holds the Maccabeans archives, but they couldn’t help. It really started me on my serious interest in the East End. Thanks again for a fascinating post. Do archives of the JFS exist? Has anyone really researched the school? Pleased to see my ancestor is still making news – Israel Zangwill’s parents were my great great grandparents. Israel Zangwill was a strong supporter of Sylvia Pankhurst and the Suffragette movement. At that time he lived on the south side of Victoria Park where so many rallies and marches took place. Thank you all for your comments: I hope you will use and enjoy the app. If you are outside the UK, you might like to look at the website version of the app, zangwillsspitalfields.org.uk. There is a blue plaque for Israel Zangwill at 288 Old Ford Road near Victoria Park. I lived in that area as a child and passed it hundreds of times and always wondered who Israel Zangwill was. Now I know. Thank you gentle author for educating me and for publishing this interesting story. Thank you so much for this post. My great-grandfather entered the school in 1877 so this is wonderful to see. Thank you, Nadia. What a great piece. Will download the app.